Every sunset over Lake Audy in Riding Mountain National Park in Manitoba, Canada is different, this one appearing to bring in the threat of a storm while this woman enjoys here last canoeing adventure for the evening. The clouds above Lake Audy in Riding Mountain National Park in Manitoba, Canada begin to darken creating unique formations across the sky while allowing the sunset colors to filter through. A woman canoeing on Lake Audy during the sunset hours is surrounded by tranquility as the lake is like a sheet a glass with the soft pink hues and clouds reflecting off the surface. This could be the calm before the storm which appears to be brewing in the clouds, but the ideal evening for canoeing. Swimming, boating and fishing are popular outdoor activities which people partake in while at Lake Audy, but many nature enthusiasts find canoeing can take you to the far shores of the lake amongst the wilderness of the boreal forests. 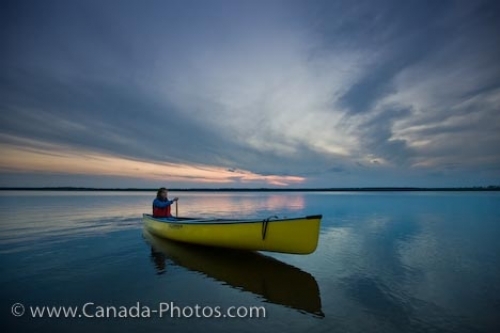 Picture of a woman canoeing on the peacefulness of Lake Audy in Riding Mountain National Park in Manitoba at sunset.